Support Wireless Sensor Network with a minimum of components in the Bill of Material. To be very low power. To have long range, several kilomteres for the SIGFOX sensor modules. RC1682-SSM, a sensor interfacing SIGFOX module that is intended for the European market. RC1692HP-SSM, a sensor interfacing SIGFOX module that is intended for the Americas and Asian markets. 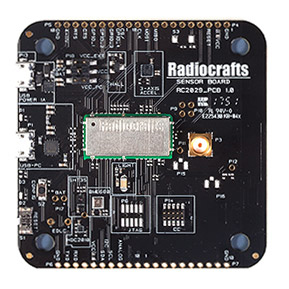 The Radiocrafts sensor board, which includes several supported sensors (listed at the end) and is a great tool for prototyping a wireless sensor network. The SIGFOX system relies on a cellular base-station network deployed by SIGFOX. The user buys a subscription from SIGFOX and gets Cloud connectivity via the SIGFOX network. The CCT tool for SIGFOX. The configurator tool to set the sensor interface parameters. The development kit that includes the sensor board. As output it can be set to toggle or drive a high or low signal.